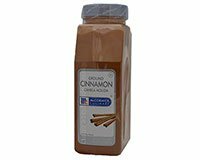 McCormick Ground Cinnamon is widely used in cakes, cookies, pies and puddings. It's also used in Asian cooking. Packaged in bulk container with removable double flip top. One side of top is shaker, and the other is open for a measuring spoon or for filling other containers.